In the ever-increasing demand for bandwidth, data center Ethernet switches are rapidly transitioning to 25GbE, 100GbE devices. 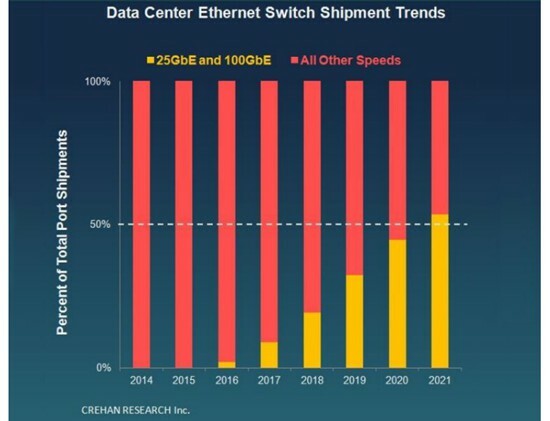 By 2021, more than 50% of Ethernet switches will use the above two standard switches, and sales revenue will exceed $15 billion, according to a new report from research institute Crehan. After several years of development, the current deployment of 25GbE and 100GbE data center switches has gained exponential growth, with port shipments reaching hundreds of thousands of per quarter. The port shipments of 25GbE and 100GbE will be higher if there is no supply limit for uplink and fiber optical transceivers connecting these switches. According to the data, the popularity of 25GbE and 100GbE switches is attributable to a number of factors, including minimal or no premium cost structure compared to 10G and 40G Ethernet switches, growth in each channel bandwidth, compatibility with existing data center fiber optic cables, and potential requirements for large-scale cloud providers. With the popularity of 25GbE and 100GbE switches, SFP+-based 10GbE and QSFP-based 40GbE data center switch shipments will decline after 2017. However, Crehan Research predicts that for the next period, 10GBASE-T data center switches are still expected to maintain a strong growth momentum.